Storm windows are inserted or placed on the outside of an existing window in order to provide better protection from strong weather and storms. They are often mistakenly referred to as hurricane or impact windows, which are actually much more robust full replacement units that are considerably higher priced. 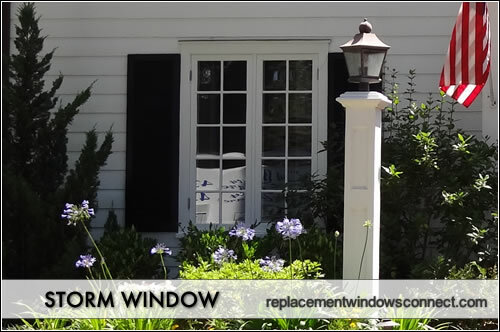 In order for storm windows to be a viable option, your current windows must be in decent shape. Storm windows are typically mounted on the outside of a window to provide an additional layer of protection. They do not replace the window as would be the case with a hurricane window, instead they are an insert that helps bolster the strength of the window opening. These inserts can be made of vinyl, fiberglass or aluminum, with aluminum being the strongest, most robust and typically the most expensive. Storm windows are much less expensvie than full replacements and add nice protection, but they don’t always perfectly match the existing opening or the exterior color scheme of a home. Storm windows range in price from $75 to $225 fully installed for a normal sized opening. (More on storm window costs.) At the lower end of the scale would be an entry level vinyl insert that is probably adequate, but not super strong. Towards the higher end of the price scale would be a well made aluminum storm window with strong glazing and seals. In the middle, consumers can expect the higher end vinyl inserts and fiberglass storms. The prices include installation, which should run $25 to $75 per storm window. Storm windows top out at $225 or $250 fully installed, while low end hurricane windows cost start at $500 and can be as expensive as $1500 per window fully installed. This is obviously a huge price difference and often times the deciding factors for homeowners who are on the fence between comepletely replacing their windows and going with the less expensive inserts. Assuming that your windows are in decent to okay shape, a storm window insert adds another layer of protection that, when combined with the current windows, makes a strong barrier against storms and severe weather systems. In addition to the added storm protection, a storm insert should help with the thermal barrier of the opening. Storm windows are actually not supposed to be completely airtight, rather they should allow some moisture and condensation to both enter and exit. This is actually one mistake that inexperienced contractors make – they completely seal the exterior insert, which can produce long term moisture problems. Storm windows are available in a number of shapes, sizes, materials and options. However, for any window openings that are not standard size or shape, getting a good fit that looks good can be a challenge. Color matching also may be an issue and this can be a real detractor from the standpoint of curb appeal. For the majority of homeowners, a nice white or off white storm window will do just fine and color shouldn’t be a huge issue. Of course, if the interior window is another color, the insert and window can have a two tone effect that is not always ideal. At the end of the day, when it comes to selecting storm or impact windows, it is usually a balancing act between aesthetics and cost.